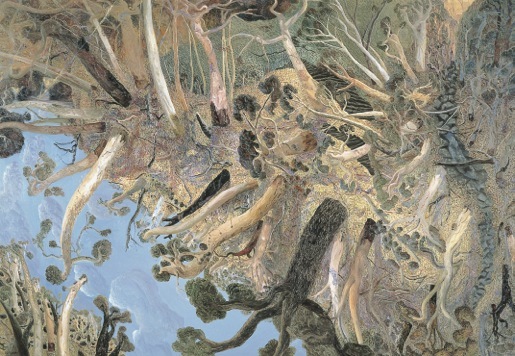 This exhibition was the first major Sydney survey of work by William Robinson, one of Australia’s most respected contemporary landscape artists. The exhibition traces the important shifts in Robinson’s art over last two decades and reveals the passionate engagement of this artist with the environment. The exhibition revealed William Robinson’s response to a sense of place : from his depictions of farmyard scenes to awe inspiring multi-perspective views of the lush rainforest canopy, looking upwards to the sky and down towards the rivers and streams. William Robinson has changed the way that we perceive landscape. His unique vision of the rainforest and its underlying narrative, the enduring power of nature over mankind, is evident in the monumental paintings from the Creation series. Robinson’s passion for the environment has been nurtured by his familiarity with his surroundings. At his Birkdale property, the artist united the animals and structures of his farm in the paintings of this period. The chaotic nature of the farmyard, with its strutting sleek black-feathered chickens, inquisitive goats, swaying cows and discarded sheets of corrugated iron, present an animated and idiosyncratic chronicle of semi-rural life. Robinson later moved to the edge of the rainforest at Beechmont and immersed himself in the landscape. Walking daily into the forest, the process of discovery started. His experiences from these walks manifested as a new mode of expression. The landscape was all encompassing, and in order to see it, and come to terms with it, he had twist and turn his head and body. Unlike the work of other artists where one views the landscape front on, Robinson’s work embody these multi-view experiences of the rainforest, to absorb the viewer and ultimately make them a participant in the landscape.